Can you really walk between all stations? How long are the underground lines? How long are the tube walks? What are your conclusions on the project? What camera are you using to take the photos? How are the GPS tracks recorded? Why are the tracks so wiggly? What other equipment do you use? 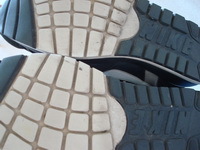 What did your shoes look like after all the walking? How are the photos processed? How are the KML tracks created? How are the KML tracks embedded? Has anyone else attempted anything similar? Have you worked on any other websites? Are there any videos of the things you’ve seen? I’m walking along the rough routes of London’s underground lines (above ground). I’m not trying to follow the exact route of the lines. What I’m doing is going between the stations on each line. As I’m walking I am taking photos and recording my route on my GPS data logger. I then publish the photos and walking tracks along with the occasional bit of descriptive text. To see a complete picture of the progress made look at the merged route map. I started in December 2007 and finished in May 2008. 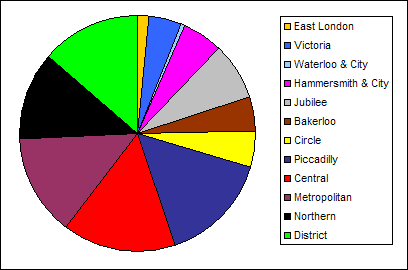 I walked the tube route on 54 separate days, averaging 7 miles per day. The total length of all the walking routes is 378.5 miles. More details on individual route lengths can be found on the tube walking logs page. The average length of walk per day is fairly low as a number of walking days ended up being very short; mainly due to the rain, but in a few cases due to spraining my calf muscle. This was one of the big unknowns at the start of the project. Now that the project is over I know that it is possible to walk the complete route of the London Underground. All stations can be reached directly by foot apart from the Heathrow Airport stations. When I got to Heathrow I made a complete loop of the airport rather than visiting the stations – this got me as close to the stations as possible without trespassing! For the whole London Underground walking project I’m tried to make sure that I followed safe and legal routes (but I’m not making any guarantees about whether my chosen routes are either safe or legal). 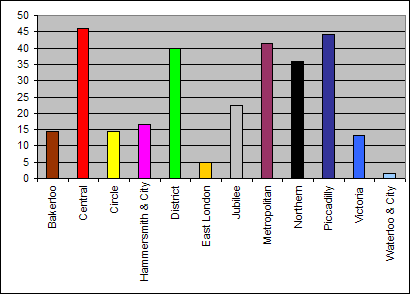 Below are two charts that show the length of the tube lines on a bar chart, and on a pie chart. The pie chart shows the lines in the order that I walked them. Distances and times for all the tube walking routes are on the Walking Log page. I took a total of 3834 photos all of which are geotagged. Doing a project like this is a really good way to see a lot of London. It is especially interesting in that I got to see many parts of London that aren’t on the usual tourist trail. Many of the new areas that I saw were very interesting but of course there were some which are a bit monotonous (particularly a number of the urban areas in zones 2-5 where many of the houses and streets look almost identical). The majority of my favourite areas that I saw are in Zone 1 and the areas at the end of lines in Zone 6 and beyond. Although the tube walking project is over I will do a few more updates to this site. These include; 1) a ‘contents’ page/post at the start of the blog to make it easier to navigate, 2) more updates to the FAQ, 3) some way of displaying my 3834 photos, 4) adding more technical details of how the blog was created and 5) if possible I’ll try to modify the blog so the posts can be read in date order rather than in reverse date order. The camera is a Sony W80 digital camera with a 4gb Memory Stick Pro Duo. 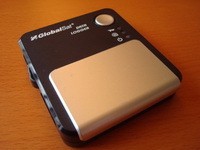 The GPS tracks are recorded using a GlobalSat DG-100 Data Logger. It is because GPS is only accurate to about 10 metres. So even though I’m probably walking fairly straight, it could appear that I have suddenly moved across the road and then back again. 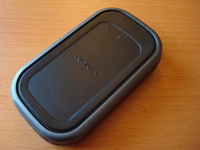 I take with me a Nokia N80 and a Nokia LD-W3 GPS device. On the Nokia is the A-Z map software and Nokia Maps. Nokia Maps can connect to the bluetooth Nokia LD-W3 GPS in case I get lost. I carry a London A-Z and a compass / whistle. I am using a number of Ordnance Survey Explorer maps to show me walking routes and rights of way that the A-Z maps do not list. These are especially useful when you get into the outer zones of the tube network and need to head off track. For the central zone a standard A-Z should be enough. Here are the maps I’ve used and the lines that they are useful for. I bought new shoes before I started, and wore them for the whole walking route. This was a very bad idea in some cases when I was walking through the countryside and trying to walk along muddy paths! 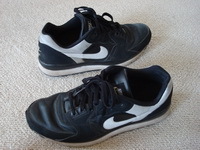 These have been my regular shoes as well for the last six months. I would therefore have expected them to be in pretty bad condition at the end. If fact despite having walked 378.5 miles for this walking project, plus an unknown amount for the past six months of my life they don’t look too bad. 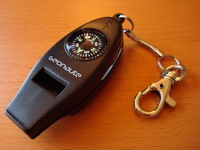 DGManager adds the GPS information to the photo. I use ACDSee Pro 2 to browse and tag the photos. ImageMagick turns each image into a thumbnail, an icon and the full size web version. The original 7.2 megapixel images aren’t included on this site as they’d be too big. It also adds the reference to this site to the full size web version. You can read more about how to batch process photos into rotated poloroids and thumbnail images here. DGManager is used to create a reference GPX file. Prune is used to remove any redundant pieces of the track and to delete any data points which are clearly wrong. A custom version of gpsPhoto is used to generate the KML. This version of gpsPhoto is not available – it is a hackily modified version of the original which is there to produce the kind of tracks that I need. The KML is embedded using the scripts detailed on this page. This blog uses a self hosted version of the WordPress blogging platform. Exec-PHP – to allow me to embed the KML and images in a shorthand way. wp-cache – speeds up page loading a bit. AddThis Social Bookmarking Widget – allows you to bookmark the pages easily. Akismet – prevents comment spam. All in One SEO Pack – creates better page titles. Google Analytics for WordPress – to track how many visitors the blog gets. Google XML Sitemaps – makes it easier for search engines to index the blog. Yes, please do. I’m grateful for any links to this site. The site is hosted by 1&1. I was the first person to complete the walks between all the stations on the London Underground. However there are a number of other completed or currently active projects with similar objectives. http://www.tubewalker.com/ – starting in June 2008 Mark Moxon will be attempting to walk between all stations (sounds familiar!). There are however some differences. Mark has planned out the whole route in advance, he plans to complete it in 42 days, he’s skipping out duplicate sections of track, and he is doing it for charity. He is walking in aid of the Cure Parkinson’s Trust and you can make a donation on his site. http://community.livejournal.com/tubewalkers/profile – London Tubewalkers are a group of people who are walking between all the stations, however instead of doing it on a line-by-line basis, they are doing it alphabetically. They are going at a very leisurely pace and you can join them on their walks. http://thenextchallenge.org/tube – In September 2010 Tim Moss and his girlfriend Laura Tomlinson completed all tube lines by running! They ran all 12 lines to support the British Lung Foundation. http://runningthetubelines.blogspot.com/ – Account of Stephen Wright’s attempt to run all of the lines on the London Underground network (starting in November 2010 and hoping to finish in 9 months). As well as this blog I’ve worked on a site about my interrailing holiday through Italy and Greece. Along my way I have taken a number of videos. You can see them on my YouTube channel at http://www.youtube.com/user/londonphotoproject.